With Valentine's Day around the corner, I thought people would like to look at Flavorwire's article, "The 10 Best Art Kisses of All Time." My two favorite pieces that are highlighted in the article are Rodin's The Kiss (1889) and Brancusi's The Kiss (1908 version found through link). 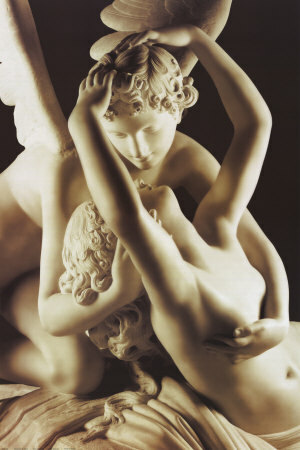 I would have also included Canova's Cupid and Psyche (c. 1787-1793, see detail here) on the list. Even though technically the figures have just kissed or are about to kiss (depending on who you ask), it's a much more beautiful sculpture than that horrid drawing by Picasso (listed as #9 in the article). Ugh. Do you know of any other works of art which are appropriate for Valentine's Day?